Even the smallest pool will take up a fair amount of space on your property, especially when you take council regulations into account. There are different council regulations on distance from site boundaries. In New Zealand it’s usually 3m from a rear boundary and 1.2m from side boundaries, but council’s in different countries will all differ regionally, so your landscape designer will need to check before you start thinking about where the pool will be installed. The rule of thumb is that a pool should allow for 5sq m per user, so for a family of four, the pool will probably be around 4.5m x 9m. Once the pool surrounds are taken into consideration, the land requirement for a pool is likely to be about 130sq m.
Nichola Vague from our Tauranga Zones Landscaping branch says her advice would be to install a pool appropriate for the size property you have and reflective of how often you will use it, and how many people will be expected to use it. Swimming pools can be made from a range of different materials, and each has its own pros and cons. The cheapest pools on the market are the above-ground variety. Made from vinyl and steel, above-ground pools are an excellent option for those on a tighter budget. You are looking at around NZ$5000 to $9500, AU$5000 or UK £2000 for these pools. You can choose to install the pool yourself, but we recommend that you rather work with a landscaping specialist for best results. Vinyl pools can also be installed in ground, but this more expensive. Fibreglass pools are the most common in-ground option. They are molded to shape then installed in the ground after a hole is dug and appropriate plumbing laid. Fibreglass is a more durable product than vinyl, but more expensive; between NZ$30,000 and $50,000, or from UK £12,000 for the pool alone. “Typically, the cost for a fully installed pool with landscaping in Australia would start from around AUD $50,000 – 60,000,” says Paul Cree from Melbourne Refresh Renovations. Concrete pools allow for greater options when it comes to shape and size. These bespoke pools are the most expensive option, with pools costing upwards of NZ$50,000, UK £30,000 up, or AUD $35,000 and higher. Concrete for these pools is poured after a framework grid is built into the hole dug by the construction crew. These pools are very durable and can have a range of finishes, including tiles and aggregates. These are the rock stars of the pool world, and you’ll be paying up to around NZ $100,000 for the completed pool and landscaping package. Sanitizers are essential for preventing the growth of dangerous bacteria, which could lead to infections. Bacteria are controlled through use of a sanitisation technique, coupled with a filter that removes the dead bacteria. Chlorine is the most widely used pool sanitiser, and is available in a number of forms. Granular chlorine is cheap and easy to use; liquid chlorine is also cheap, and is less likely to cloud the pool granular chlorine. Both need to be applied manually. Salt water chlorination uses a device to transform salt into chlorine, which then cleans your pool. Although these are expensive initially (around NZ$1500, UK £925, and AUD $700) you will save money in the long-term and the devices automatically balance the pool’s pH levels. Concerns about the health consequences of chlorine have led to the development of alternative pool treatments, such as ozone technology. Ozone is a powerful steriliser that destroys bacteria. Ozone generators for pools produce ozone in the water, and keep the water clean and safe; they also balance the pH level of the pool, and they cost around $500 in New Zealand and Australia, and UK £600. 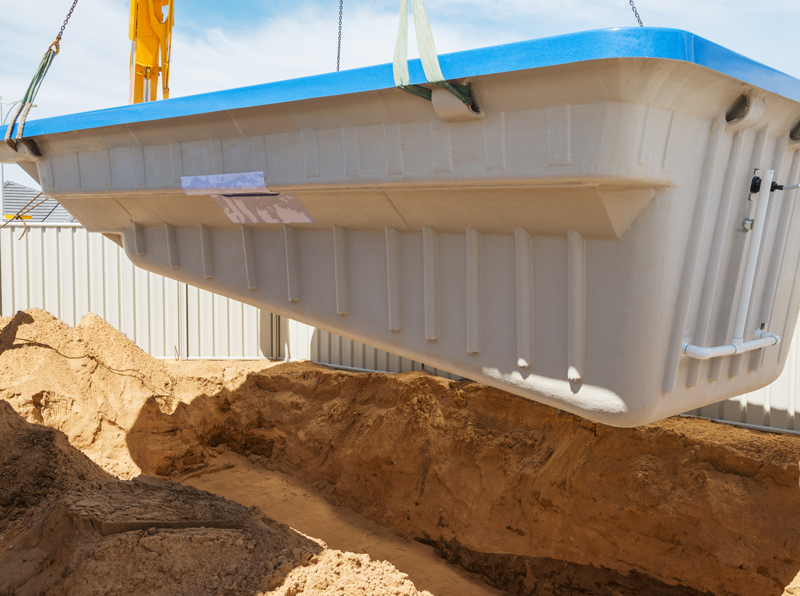 Paul Cree says that the basic installation of a fibreglass pool is around 10 days, the basic installation of a concrete pools is around 10 weeks. “The whole process to fully complete a pool installation, including all fencing/decking/landscaping is normally a minimum of 2 months, but could be up to 6 months for a large concrete pool with other features such as spas, pool house, entertainment systems,” he says. 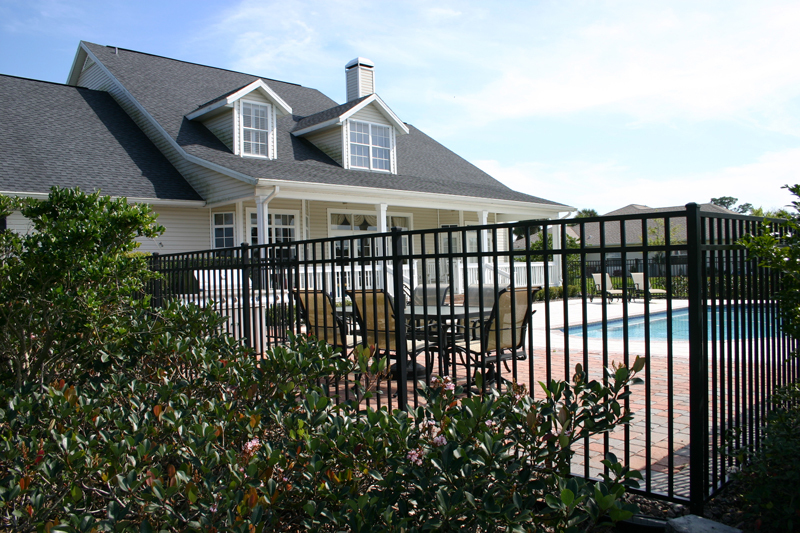 Ask your Landscaping Designer about Swimming Pool fence regulations in your area. This time frame is the same across countries, so it pays to get your project started a few months before summer if you want to use your pool as soon as the weather warms up. Nicholas says that for a completed basic pool with all landscaping done, you should expect to pay between $60,000 and $100,000 New Zealand dollars. You’d be looking at the same amount for a pool in Australia, with anywhere between £30,000 to £60,000 in the United Kingdom. Obviously, prices can soar much higher depending on materials, landscaping and other costs. It's best to arrange a briefing meeting with a Zones Landscaping Specialist to get a clearer picture of what it would cost to install a swimming pool in your garden. If you would like to discuss options and ideas for your outdoor landscaping project, please use the enquiry form on this page to provide us with your contact details. We will get in touch with you at a time that suits you to discuss your landscaping project. If you would like to provide us with more information about your project, we have a more comprehensive enquiry form on our "Get in touch" page too.